Just wanted to let you know that the November edition of the Highland Wood News is out and ready for you to read. We have an exciting issue this month, with contributions from a few regulars and a couple new items for you as well! 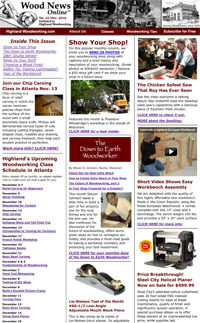 Customer Richard Rank gives us his take on how this is shaping up to be The Year of the Workbench; Alan Noel presents an in-depth article providing many tips for choosing a finish; and Steven Johnson, our Down to Earth Woodworker, delves into many topics this month, including a primer on how to prepare your workshop for a potential disaster as well as a continuation of his column from last month, where he discussed the future of woodworking. We also have several great video links for you, including a lesson on how to sharpen a plane blade, a follow-along video for assembling the affordable European workbench, and the video everyone has been talking about – Roy Underhill and a piece of southern fried chicken versus a Sawstop. Check it out here if you haven’t seen it yet, and watch it again if you have! All this plus some great deals makes this month’s Wood News a great read. But don’t take my word for it – go take a look yourself! November Wood News: Now Available!